For the past couple of weeks I’ve been craving making something with Oreos. They’re one of those cookies that once I get them on my mind, I have to eat one. They’re pretty much like crack. 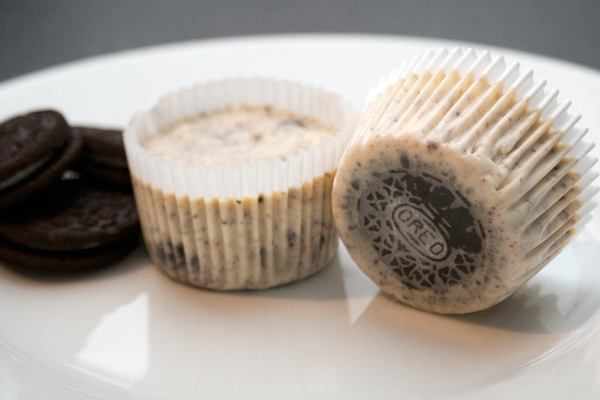 These mini Oreo cheesecakes are simple and delicious! They’re from one of Martha Stewart’s recipes. Her version says that it makes 30, but I got quite a few more than that. Make sure you store these in the fridge until you’re ready to serve to avoid having them get mushy. 1. Preheat oven to 275° F (135° C). Line a cupcake pan with paper liners. Place 1 whole Oreo cookie in the bottom of each lined cup. 2. In a large bowl, beat the cream cheese on medium-high speed until smooth, scraping down sides of the bowl as needed. Gradually add the sugar, and beat until combined. Mix in the vanilla. 3. Drizzle in the eggs, a little at a time, beating to combine and scraping down sides of bowl. Add in sour cream and salt, beat until combined. Using a large spatula, fold in the chopped Oreo cookies. Do not use a mixer to mix in the Oreos, as they’re chop them up too much! 4. Fill each cookie-filled cup with a few spoonfuls of batter until each one is nearly filled to the top. Bake, rotating muffin tins halfway through, until the filling is set, about 22 to 28 minutes. 5. Transfer the cupcake pan to a wire rack to cool completely. Once cool, refrigerate them at least 4 hours (or overnight). To help the cakes keep their shape better, leave them in the cupcake pan in the fridge.